1. First, make the dough. Mix the flour and salt together. Cut the butter into the flour, then add enough of the water to make a soft and smooth dough. It should not be sticky, but it should not be tough, so adjust accordingly. Knead until smooth (about 5 mins with a stand mixer fitted with a dough hook). 2. 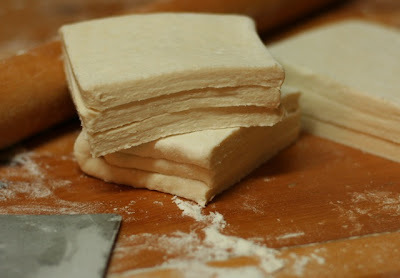 Place the dough on a lightly floured pastry mat and stretch/pat it into roughly a 12 inch square. Cover with plastic and refrigerate (I do the mat and all to make it easier) for an hour. 3. While the dough is cooling, make the margarine block. Place the margarine (or margarine/shortening mix) on a silicone mat or piece or parchment paper. Starting with your hands, but moving to a pastry scraper when the margarine gets sticky, work the margarine to make it pliable. 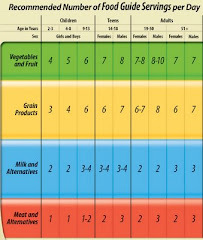 If you are using a margarine/shortening mix, make sure it is well blended. Sprinkle the flour over top, then use the flat side of the pastry scraper to work it into the margarine. If the mixture gets too warm, stick it back in the fridge for a while and try again later. It is essential to keep everything cool or cold. 4. Lightly spray a piece of parchment paper with oil, then transfer the margarine flour mixture to it. Lightly spray the margarine with oil, then place a piece of cling wrap over top. 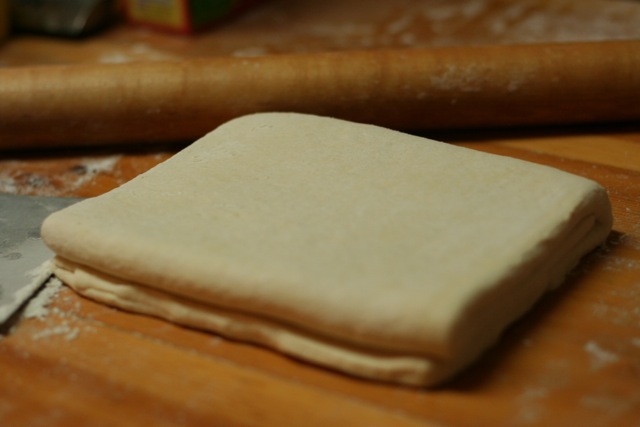 Using your fingers, press the mixture into a 6 inch square, using the pasty scraper to square everything up perfectly. Place in the fridge until ready to use. 5. Now to laminate. The key here is to make as perfect a rectangle (or square) as possible, and to have your dough an even depth. The trick is to roll from the centre to the corners first, then along the length and width of the dough to even things up. So, remove the dough from the fridge, make sure the pastry mat is still lightly floured, and roll it into a perfect 12 inch square. Remove the cling wrap from the margarine and place margarine side down on a diagonal in the centre of the dough (i.e. it will look like a diamond in the centre of a square. Carefully peel off the parchment paper. Fold the corners into the centre to make an 8" square, make sure no air is trapper inside, and seal the seams. Take your time here, making sure each seam is carefully but firmly pinched together and completely sealed. If your margarine starts squirting out when you begin rolling the dough, all will be lost. 6. Turn the dough over so that the seams are on the bottom, and make sure your pastry mat is still lightly floured (the dough needs to slide on something so it does not stick and tear). Carefully roll the dough into a 24" x 8" rectangle. Do not press too hard or work the dough too fast. If it keeps shrinking back, let it relax for 5 mins and try again. Square everything up as perfectly as possible. Now, with the 8" side facing you, fold the bottom 1/3 up, then to top 1/3 down, like you are folding a letter. Cover in plastic and put back in the fridge for 30 mins. I like to do all this on the pastry mat so I have a rolling surface and a way to measure the dough. 7. After 30 mins, remove the dough from the fridge. Making sure the seam from the first fold is on your left, carefully roll the dough into another 24" by 8" rectangle. Fold exactly like you did before, and refrigerate for 30 mins. You want to repeat this so that you end up doing six folds in all (yes, this is going to take a while). You could stop at five and no one would notice. With every fold the dough will get more delicate so please be very careful! One errant poke of a thumbnail can tear the dough and ruin your lamination. 8. When all the folding is done, refrigerate the dough for a few hours, or up to overnight. You can also divide the dough in half or quarters, wrap tightly, and freeze for one month. A NOTE ON MARGARINE: I had the best luck with Earth Balance baking sticks since they best approximate butter in firmness and performance. Softer spreadable margarine led to disaster because it squirted out from between the layers of dough. But, I also find that Earth Balance has a bit of a taste and so mixing it with a more neutral non hydrogenated vegetable shortening can help with that whilst making for a very flaky pastry.